value - this is the actual number of columns we wish to display. If we provide a number that is less than the number of column in our control, the columns that are not being assigned a value to will display the default maximum value. This is useful when we wish to display just a range of our chart values. offset - will move the starting value of our first and subsequent columns to the value provided. So, if we have 100 values and we want our chart to display the values starting at the 33rd value, we set our offset to 33.
size - is the number of values we wish to display. If we have 100 values and we want our chart to display only 10 of them, here we set our value. In this method you can also notice that we assign the value of each chart bar to our integer array InputData. What it actually does is take all the values in our integer array, assign each value a column and create as many rows as the actual value. If the value is smaller than the maximum value of our control, the rest of the rows are set to the BackColor property of our control. The rows that are within our integer value, are split between our minimum, medium and maximum values, so they can be drawn with the corresponding colors. Now, you can replace the integer array with some values retrieved from a database or whatever numerical data you need to display. I think this is closer to looking like a VU meter than a bar chart. But a nice tutorial. Thanks for the hard work. 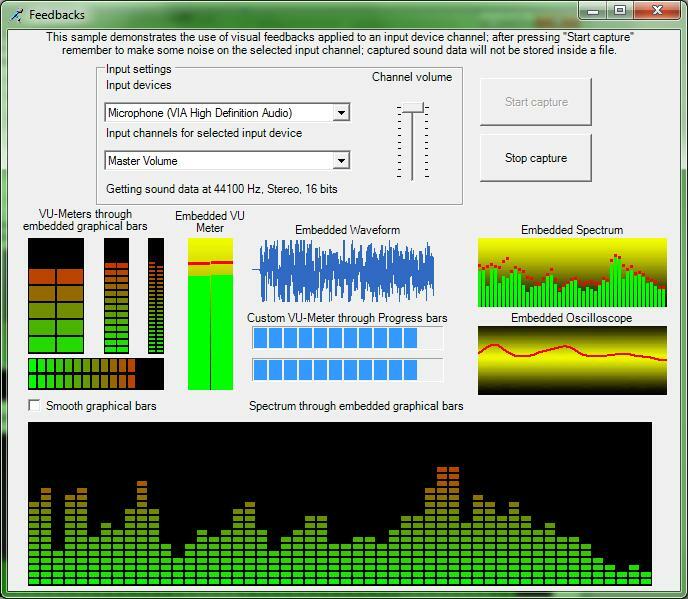 Yes, indeed, it might be used as a VU-Meter control, and i was thinking of naming it that way, but if i were to chose that name, i would have had to also provide an example of using it with some media player; for that, i would have had to also create a tutorial about getting the audio stream, split it into different frequences that can be measured, etc. This way it's simple and easy to understand. Why not try and make a 3D bar chart ? hello everyone, i am a new member in this site and i cant see this tutorial!! Hello. Sorry, the spoilers aren't working in tutorials. I've attempted to removed all the spoilers below.